This means, not only addressing the needs of digitally excluded users when designing services, but also to take stock of key policy areas and think about where increasing people’s digital capability might improve that policy outcome. For example, could giving people the digital skills needed to find out more about their health condition and the treatment they may need lead to people feeling more empowered? 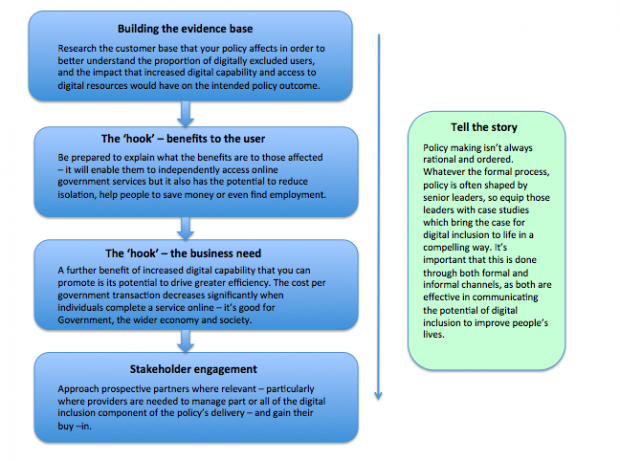 Embedding digital inclusion in policy can be a difficult concept to grasp and we are keen to offer departments support in fulfilling this particular strategy commitment. Members of our Digital Inclusion Departmental Sub Group asked us to create a ‘route map’ setting out the high level stages of embedding digital inclusion in policy outcomes. We have spoken with NHS England to better understand the stages they went through for their Widening Digital Participation programme - further information below - and produced a first version of a route map, which can be found here. We hope this is a useful starting point - please let us know what you think so we can iterate based on feedback and as further case studies come onboard. NHS England is very clear that we need to take action to ensure the digital revolution in health doesn’t pass by the very people who need it most. So how are we putting policy into practice? Since 2013 NHS England has been funding a programme of digital skills training (Widening Digital Participation), working with the Tinder Foundation to mobilise an extensive network of training activity in community based UK Online Centres. Local centres work with internet beginners to introduce them to online health through a specially developed LearnMyWay course. An introductory course, focusing on accessing health information using NHS Choices, was launched in 2013. A new module, covering accessing GP services online (appointment bookings and prescription requests) was launched in 2014. Over 120,000 people have been trained in digital skills for health since the programme started. But it’s not just about the numbers. We’re also really encouraged by the impact getting online can have on people’s lives and their health. Ongoing evaluation is showing real evidence of people feeling more confident about using online tools to manage their health. Even more important, skills and confidence are translating into real behaviour change with learners saying they are more self reliant, making fewer visits to a health service, and adopting healthier lifestyles.